A book of abstracts collecting all the contributions presented during the 2nd Joint Annual Meeting of the POnTE and XF-Actors projects in Valencia on the emerging plant diseases. A multidisciplinary research program implemented by an international consortium of 29 partners. Funded by the European Commission as part of the Horizon 2020 program. List of olive cultivars under evaluation, based on the year in which the experiments were started, both in the greenhouse (artificial inoculations) and under field conditions (exposure to infected vectors). 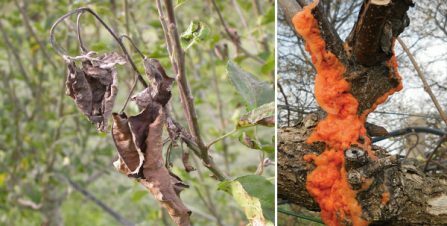 A collection of pictures showing symptoms associated with the presence of Xylella fastidiosa in susceptible host plants in the different Countries where the pathogen is known to occur.